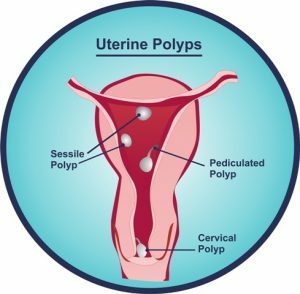 Uterine polyps (endometrial polyps, intrauterine polyps) are benign overgrowth of endometrium (internal lining of uterus) – finger-like growths that attach to the wall of the uterus. They look soft red and often flatten to fit the cavity of the uterus. Uterine polyps could have short stalk and they vary in size (from few millimeters to several centimeters). Women could have single or multiple polyps. Clear cause of uterine polyp is not known but most experts mentioned correlation with increased levels of estrogens (main female hormones). Scientists suggested two theories about appearance of polyps in the uterus. According to first theory, abnormal response to estrogen can stimulate the growth of endometrial tissue. 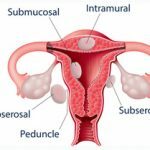 According to second theory, chronic inflammation could trigger irritation and overgrow of endometrium. Tamoxifen users (breast cancer treatment). Infertility (uterine polyp that develops near the Fallopian tubes may obstruct the opening of the tubes and lead to infertility). Treatment is pretty simple – once polyp is identified, it should be removed surgically by qualified experts. Histological examination of removed tissues should be done to exclude cancerous cells. Some experts indicate that polyps under 1cm (without symptoms) can even spontaneously regress without any treatment (especially in postmenopausal women). Some experts recommend hormonal treatment (gonadotropin-releasing hormone agonists and progestins) for regulation of hormonal imbalances. In most cases polyps can be easily removed and/or treated but there is a high probability of recurrence (up to 50% of cases). Very rare polyps can be cancerous or precancerous (about 4-5% of cases). The chance of cancer is higher in postmenopausal women and Tamoxifen users. 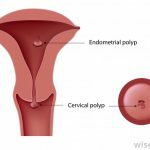 Cervical polyps are common – in most cases they occur in women after 20 (mainly in women who already experienced deliveries). 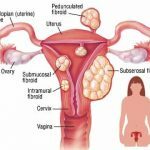 Uterine fibroids are the most common benign (non-cancerous) tumors in women – it is actually the growths that develop in the muscular wall of the uterus.